Launched to the general public 60 years ago, the iconic Ericofon telephone was symbolic of an era of growing prosperity and hope. Decades of economic hardship, starting with the Great Depression followed by World War II had left much of the world severely disrupted. In the mid-1950s, Europe was still rebuilding itself and food rationing in the UK didn't even end until 1954. But things were beginning to get better, and consumer goods were becoming much less utilitarian. 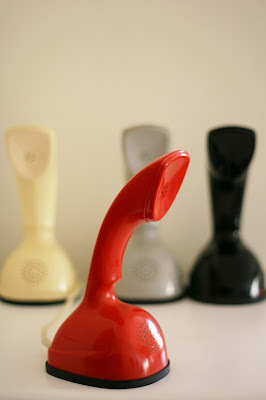 The Ericofon was a complete re-think about the industrial design of a telephone handset, which had pretty much settled into a two-piece affair with a handset sitting on a cradle, with the dialler, bell and everything else housed underneath. The snake-like design earned the Ericofon the nickname "Cobra" in some markets, but if that wasn't striking enough then the wide variety of bright colours (18 initially) that the device came in were certainly eye-catching. One thing that made the Ericofon particularly desirable was that in many markets you were not allowed one. Monolithic old telephone carriers such as GPO in the UK and AT&T in the US simply didn't allow equipment to be connected to the network that didn't come from themselves. Elegant design and exclusivity is often a recipe for success, and it seemed to be true for the Ericofon. Variants of the phone were made for several different markets with two main types of case, and the phone's radical looks made it a favourite in movies and TV shows over the years. Between 1956 and 1982 some 2.5 million Ericofon handsets made in Sweden were sold around the world, with licensees and contractors making many more. Modern reproductions of the Ericofon are available, but if you want an original one then prices vary from €50 or even less up to several hundred euro depending on type and condition. Ericsson went on to produce mobile phones such as the iconic R380, a business that was merged with Sony's to form Sony Ericsson in 2001 (the T610 being an example product), and which was finally bought out by Sony in 2012 when Ericsson left the consumer market behind for good.